As the hapless former US Secretary of State Donald Rumsfeld once said about predicting the future, there are known knowns, known unknowns and unknown unknowns. At the time his turn of phrase was widely mocked although it has since won grudging respect and looks like genius compared to what passes for analysis at the top of the White House administration these days. There seem to be more known unknowns on the horizon as we face 2019, not least because the terms of the UK’s departure from the European Union remain clear as muck. Add to this the further known unknowns caused by the impact of the US ramping up trade protectionism, the price of oil and gas and then the more unknown unknowns of climate change, those of us considering impacts on the economy in the north of Scotland are all looking through a glass darkly. However, the UK government’s abject failure to make sense of Brexit has galvanised industry to set out what it sees as the risks if the UK crashes out of the common market and other niceties of the union. A group of business leaders across Scotland’s £14billion farming, food and drink industry has warned a hard Brexit would be “catastrophic” – costing them £2billion in lost sales. This figure was “on top of the short-term chaos resulting from transport delays and labour shortages” caused by a collapse in the availability of European workers. The group, which included the National Farmers Union Scotland (NFUS), Quality Meat Scotland (QMS), Scottish Bakers and Scottish Salmon Producers Organisation, said that the food sector – which is dominated by industries and primary producers in the north and north east – relied on Europe for 70% of sales. Before Christmas, members of the ANM Group co-operative already started to experience Brexit impact. In the auction ring at Thainstone the price of gimmers – breeding-age female sheep – fell slightly. NFUS has predicted a no deal will see tariffs of 46% on lamb and 65% on beef. However, even if a deal is agreed, the implications for north businesses remain worrisome. 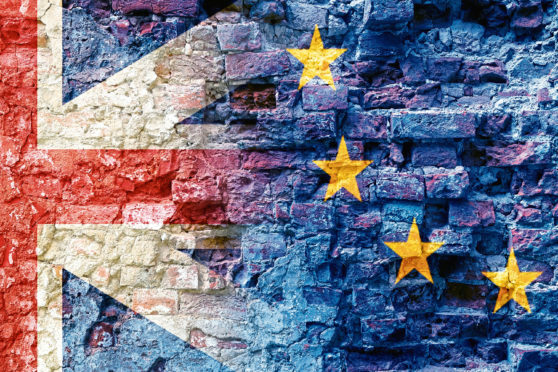 Although oil and gas operators are largely relaxed about Brexit, trade body Oil and Gas UK has highlighted that it faces difficulties around 15,000 – or 5% – of the North Sea workforce who are European as well as the potential for critical supply chain snags. European workers are also a major concern for tourism. Under a potential transitional agreement, EU workers would be allowed to stay at least until 2021 – however it is still uncertain if these agreements will stand. David Richardson, Highlands & Islands Development Manager for the Federation of Small Businesses (FSB), said: “Low population densities, an aging population, low unemployment and increasing visitor demand have combined to make staff recruitment in the Highlands & Islands ever more difficult. “The life-saver has been the influx of workers from Europe – skilled people with strong work ethics – and in 2017, FSB research found that 41% of Highland employers had at least one EU worker on the books – its 45% for tourism businesses. “However, despite this influx, an FSB survey of Skye employers conducted in August 2016 found that almost a third (31%) did not have enough staff to meet their needs, while our survey of island-based businesses in September 2017 revealed that 37% were short-staffed. “Clearly, we desperately need to attract and retain EU workers, but the UK Government’s recent Immigration White Paper makes this extremely difficult, taking a one-size-fits-all approach to the UK, one that fails to recognise the differing needs of regions like the Highlands & Islands. In particular, it sets a very high salary threshold and it requires small businesses to use the UK’s complicated points-based immigration system. Marc Crothall, Chief Executive, Scottish Tourism Alliance agrees. He said: “Brexit remains one of the biggest threats to Scotland’s tourism industry, particularly with regards to the recruitment and retention of an EU workforce. The UK Government’s measures on immigration published in the recent white paper are likely to have devastating effects on Scotland’s tourism industry, in particular, the proposed £30,000 minimum salary threshold for tier two visa were this to be passed by legislation following a consultation. “If so, there is no doubt that the government’s plans will exacerbate the existing recruitment challenge the industry is already facing due to what we are hearing as being a steady decline in international workforce retention and application and there not being a sufficient number of skilled workforce available to tap into, placing the sector which is one of the most important economic drivers for Scotland in severe jeopardy. “Scotland’s situation is unique; we have very fragile areas in our economy and it is more important than ever that we’re able to attract and retain people, particularly in the Highlands and Islands and other rural areas. However, Andrew Milligan, head of global strategy for Aberdeen Standard Investments, reminds that while Brexit is a major headache here, it is only a drop in the global economic ocean. Luckily, Brexit chaos is not expected to be worsened by global recession. Unless someone makes some huge mistake – or an unknown unknown. Likewise, with Brexit effects taking a bite out of the UK and Europe and North America fending off economic weakness, Mr Milligan thinks it is unlikely for interest rates to rise. He said: “Although the benefits of tax cuts and spending increases in the US are starting to fade, we are seeing governments in China, Japan, the EU and the UK look towards easier fiscal policy.